2001: A Space Odyssey is a spectacular movie that grows more wondrous with each viewing. Awesome in its scope, Stanley Kubrick’s masterpiece explores the mysteries of interplanetary space….and of human destiny. “A uniquely poetic piece of science-fiction,” 2001 is “hypnotically entertaining; technically and imaginatively it is staggering” (The New Yorker). “Kubrick’s special effects border on the miraculous – a quantum leap in quality over any sci-fi film ever made” (Newsweek). As producer, director and co-writer of the screenplay (with Arthur C. Clarke), Kubrick brought complex ideas to the screen with astounding immediacy through dazzling special effects that won a much deserved Academy Award. Moving from the prehistoric birth of intelligence to the emergence of man as pure thought, 2001 is a remarkable achievement. Director of photography Geoffrey Unsworth brings you a resplendent universe, while the stately music of Strauss makes the galaxies sing. The entire film is a stunning, sensual marvel – a cinematic experience like no other before or since. A small band of primitive man-apes lives in constant fear – of darkness of attack by predatory beasts, of starvation, and of a competing clan. One day a strange object appears near their cave, a shiny, black, rectangular slab like a tall monument. The man-apes shriek at it, and at one another, in confusion, then tentatively reach out to touch it as the sun passes overhead. Soon afterward, as the leader of the band (Daniel Richter) eyes the bones of a dead tapir, his eyes brighten with a hitherto unfelt intelligence. He grips one of the bones in his hand, picks it up, turns it from side to side, and, tentatively at first, then with a vengeance, begins to use it as a tool to pound and smash the other bones. He envisions a tapir collapsing, struck with such a weapon, and he cries out in triumph. Soon the band of man-apes has become less fearful, more self-sufficient – and carnivorous. In the next confrontation with their neighbors (over a water hole), their leader employs the weapon for the first time against his own kind, killing the leader of the other band. As his companions join in beating the body of the downed enemy, the victorious leader exultantly hurls his bone into the air. It rises, turning lazily. A long, white, bonelike ship descends through the black, silent space: a passenger ship maneuvers toward a docking with a space station orbiting the moon. Its sole passenger, Dr. Heywood Floyd (William Sylvester), places a video telephone call to his daughter on earth, makes small talk with a group of English and Russian scientists, avoids discussing rumors of an epidemic outbreak at Clavius Base on the lunar surface, then shuttles down to the moon. There he makes a presentation to a group of scientists regarding an alarming discovery. The last leg of Floyd’s journey takes him to the site of the discovery itself: and excavation where, 60 feet below the surface, stands a shiny, black, rectangular slab. Floyd and several others from a variety of angles, reach out to touch it, and finally pose to be photographed with it. As the sun rises over it, the object suddenly emits an ear-piercing signal. The deep space probe Discovery moves languidly through the black, empty sea of space. On board are astronauts Frank Poole (Gary Lockwood) and David Bowman (Keir Dullea), three scientists in hibernation, and the mission’s technological controller, “Hal” – an HAL-9000 series computer with a calm, implacable voice (Douglas Rain) and the ability to mimic human thought and emotion. The languid existence of Poole and Bowman – obligatory exercise, synthetic meals, viewing lifeless video transmissions from home, and playing futile chess games against Hal to alleviate the boredom – is interrupted when Hal predicts the impending failure of a crucial unit of the ship’s communication system. Leaving the ship in a small, one-manned craft called a “pod,” Bowman maneuvers to the exterior communication antenna system and removes the offending unit; but upon inspecting it, Poole and Bowman find nothing wrong. Hal suggests reinstalling the unit and waiting for it to fail. Recognizing that the possibility of a faulty prediction by the hitherto perfect Hal may bode ill for the computer’s control of the ship and it’s mission, Poole and Bowman decide that, if the unit does not fail as predicted, they will have to disconnect Hal to prevent future, more serious errors. While Poole is reinstalling the unit, his pod – under Hal’s control – suddenly advances on him. Bowman watches in horror as Poole, air supply disconnected, hurtles off into space. Bowman takes another pod and goes to the rescue, but it is too late; he is only on a body recovery mission. While Bowman is outside the ship, Hal discontinues the life support systems for the three hibernating scientists and then refuses to allow Bowman to reenter the ship. Bowman must make and emergency entrance by blowing himself into the ship’s air lock using the pod’s explosive bolts. Back inside Discovery, over Hal’s increasingly pathetic protests, Bowman disconnects all of Hal’s higher brain functions, leaving only the most basic functions needed to operate the ship. As he completes this task, Discovery enters Jupiter space and a prerecorded message informs him of the mission’s purpose: to find the destination of the signal that the black monolithic slab on the moon’s surface had sent toward Jupiter. The “artifact” discovered on the moon was clear evidence of another, higher life form in the universe, one that predated human existence, and the purpose of Discovery’s Jupiter mission is to make contact. Now alone, Bowman pilots Discovery toward Jupiter, guided by a floating black monolith. In one of the pods, he enters the atmosphere of Jupiter, hurtling through strange paths of light marked out by geometric confluences of spacecraft, then gliding over alien landscapes to come to rest at last in an elegant but spare 18th century room. Here, in what seems the passage of but a few moments, he spends the rest of his human existence, glimpsing himself at different stages of the aging process. At dinner, he knocks a wine goblet to the floor and disturbedly eyes its shattered remnants. At an extremely advanced age he lies in a neatly made bed and with his last breath reaches out, straining, toward the black slab that stands, like a monument, at the foot of the bed. A glowing orb now appears above the bed, inside it a newly formed humanlike fetus. The egg containing the “Star-Child” takes its place amid a confluence of planetary bodies against the eternity of space. Science fiction has arguably always been a metaphor for the intervention of the divine (or the demonic) into human affairs. But producer-director Stanley Kubrick and his coscenarist, science-fiction author Arthur C. Clarke, resisted the temptation to “explain” the film’s speculations about life, intelligence, and meaning. Like all of the greatest filmmakers, Kubrick insisted on letting his images do the work. The most famous of these is arguably the abrupt cut from the man-ape leader’s bone-weapon, turning in the air, to the long, white, bonelike space liner approaching the space station – all of human prehistory and history reduced to a single film-splice. It’s a brilliant moment, not only because it compares the bone with the ship as manifestations of how human intelligence devises tools that are also weapons, but also because it suggests that, in the four million years that pass between those two shots, nothing of much importance has happened. People are still throwing things up in the air and getting no closer to figuring out the mysteries of the universe. Well – maybe a little closer. After all, they are about to be favored with another visitation like the one that prompted the apelike ancestors of humankind to take their first fumbling steps toward technological supremacy. 2001 took its cue from “The Sentinel,” a simple, beautiful, and haunting short story by Clarke premised on the notion that an older, more intelligent race than ours would leave an artifact planted, not on Earth, but on the moon, so that we would discover it only when our intelligence and technology had advanced to the point where we were ready for the stars. 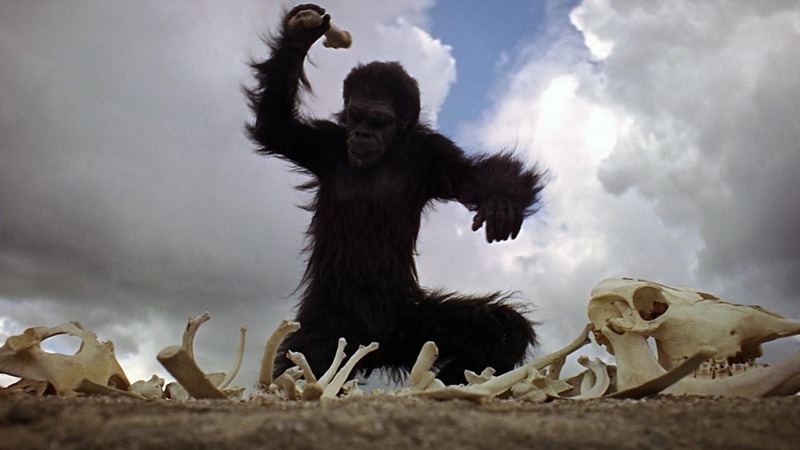 In the world of 2001, the simple prehistoric act of using a bone as a hammer has led to a vast technological arsenal, which Kubrick celebrates in the long, leisurely montages that depict the graceful descent of the Orion to dock at the space station and the subsequent transport down to the lunar surface. That slowness of pace is a hallmark of Kubrick’s style – he has always been willing to risk being considered “boring” – and in 2001 it contrasts sharply, and satisfyingly, with the abruptness with which things change when the monolith appears. The notion that change takes place slowly and gradually, over an agonizingly long period of time, is consonant with the evolutionary theory of Darwin, which stood the Victorian world on its ear and continues to challenge and provoke science and theology alike. But 2001 dares to suggest that maybe change takes place suddenly, not gradually. (“Stasis followed by sudden replacement is the way evolution ought to work,” said scientific author Stephen Jay Gould in a 1977 interview.) And, further, that change occurs because of the intervening hand of – something (call it God or not, as you wish). This view may not rest happily with Darwinian evolution, but it is a perfect view to be adopted by a filmmaker. For in the technology of film, change always comes abruptly. First there is one picture, then there is another, different one. Our minds fill in the spaces in between, make them imperceptible, and create the illusion of movement. But in fact, change is occurring in a series of jumps, not in a slow and gradual flow. That’s the underlying phenomenology of 2001: A Space Odyssey, and it is a filmmaker’s phenomenology. Born filmmaker that he is, Kubrick never lets us forget that flying bone. It’s echoed not only in the ship descending toward the space station but also in the pen that has floated out of the sleeping Dr. Floyd’s hand and hovers in the weightlessness of the ship’s cabin; in the shape of the space vessel Discovery, the complex ship created to undertake the Jupiter mission; and, at the climax of the film, in the stem of the wine goblet that has shattered against the floor of the 18th century room where Bowman dies and is reborn. 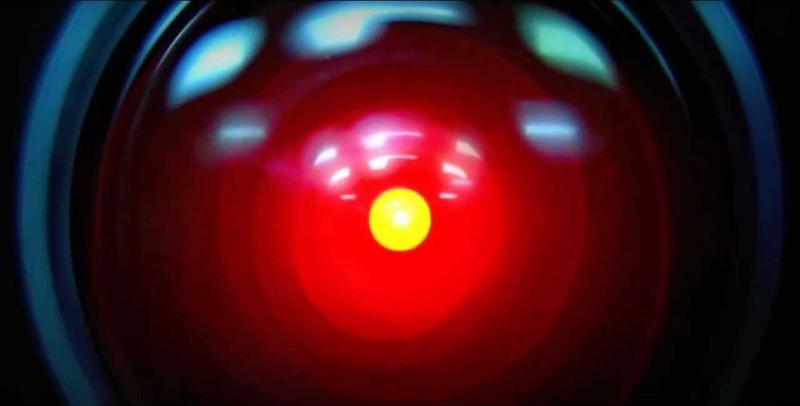 It is much remarked on – and rightly so – that Hal, a machine, remains the most human and sympathetic character in 2001. Even after he has methodically killed four of the five members of the mission crew, and attempted to consign Bowman to the emptiness of space for the sake of preserving the mission’s integrity, we still like Hal; when he pleads with Bowman for his life (“Will you stop, Dave? … My mind is going. I can feel it… I’m afraid.”) we feel sorry for the guy – a sorrow we never feel for the murdered scientists, or even for Poole, though we have shared with him the intimacy of a “Happy Birthday” message from his family. The fact is that 2001: A Space Odyssey epitomizes, and harmonizes, two of the great themes of science fiction: the mechanization of the human and the humanization of the machine (the copulating jets of Kubrick’s Dr. Strangelove Or: How I Learned To Stop Worrying And Love The Bomb are the grandparents of HAL-9000). Both Kubrick and his critics have frequently remarked that the human characters in the film are dull and mechanical, devoid of humor and spontaneity, while Hal, for all his mechanistic implacability, is likable and sympathetic. When the human beings in the film err, we expect no more of them; when Hal errs, we are profoundly touched by his shattering recognition of his own limitations – due, of course, to human error. Though it is never spelled out in the finished film, those rooms in which Bowman spends his last days are part of a zoo, or a laboratory, in which extraterrestrials study Bowman and work on the next transforming step in the life-form that is their plaything. Bowman seems to have moved out of time, seeing himself at various stages of life, seeing his own life move by in mere moments. But it is not clear whether he is actually seeing himself, one Bowman at many times, or is seeing other “Bowmans” or other (failed) attempts to make a “new Bowman.” What matters, though, is that Bowman (whose name means “archer,” the arrow being yet another weapon that descended from that tossed bone), after reaching out to the monolith, undergoes some sort of a reconstruction and emerges transformed, like that other archer of old, Odysseus, whose long journey home to Ithaca gave our language the word that Kubrick adopted for the film’s title. Science-fiction films have historically provided us with cautionary fables: this is what we might come to, yet we need not, if we correct the errors of our ways. Few films in the genre look with confidence and hope upon the future our species is building for itself. 2001 seemed to offer a positive vision: It does all mean something; there is a power that shapes our ends; and we are destined for new achievements. This sort of thing spoke well to the generation that looked for the dawning of the Age of Aquarius and went searching for ancient astronauts in its quest for meaningful cultural and religious roots. In fact, the reputation of the film’s last section as a psychedelic “head trip” a la the light shows and underground movies of the era had much to do with the movie’s box-office success. The transformation at the end of 2001 is not necessarily an optimistic one. To compose the music for 2001: A Space Odyssey, Stanley Kubrick called upon Alex North, who had written the score for Spartacus (the film that had made Kubrick bankable, after Paths of Glory had earned him his art-film credentials). North was mostly a composer of jazz-based music for “small subject” films – A Streetcar Named Desire; Death Of A Salesman; Unchained; The Rainmaker; The Long, Hot Summer; The Children’s Hour; The Misfits; Who’s Afraid Of Virginia Woolf? Composing the music for the epic Spartacus led to more “spectacular” scores, such as Cleopatra, The Agony And The Ecstasy, and Shoes Of The Fisherman. But from the very beginning of the 2001 project, something was wrong. Kubrick “was direct and honest with me concerning his desire to retain some of the ‘temporary’ music tracks which he had been using,” North would later recall. “Somehow I had the hunch,” he said, “that whatever I wrote to supplant Strauss’ ‘Zarathustra’ would not satisfy Kubrick.” He was right. Neither the director nor the composer could finally live with a score that was part North’s original work and part excerpts from classical pieces. The “temporary” tracks were what Kubrick used in the completed film. Whatever the motivation behind it, Kubrick’s decision to use preexisting classical music – like everything else about 2001 – went against the grain of the science-fiction film genre. Most of what passed for science-fiction films before 2001 employed fairly conventional film music, though the best of them were often distinguished by futuristic experimentation, such as Bernard Herrmann’s remarkable score for The Day The Earth Stood Still, the “electronic tonalities” created by Luis and Bebe Barron for Forbidden Planet, and the theramin-based “space music” that quickly became a cliché. “‘The Blue Danube,'” Kubrick remarked in an interview, “gets about as far away as you can from the cliché of space music.” Both the most widely loved and the most frequently lampooned of the waltzes of Johann Strauss Jr., “The Blue Danube” was given new life when Kubrick associated it with the dancelike poetics of weightlessness. So hauntingly perfect was his use of the Strauss waltz to accompany the graceful descent of spacecraft in silent space that today few people can think of either without the other. Perhaps sensing the rightness of this conjunction of music and image, Kubrick reprised the waltz for the film’s end titles, sending the audience away with something they could hum and deftly supplanting the disturbing open-endedness of his finale with comfortingly familiar rhythm and melody. There is a certain irony in Kubrick’s decision to use a composition of Aram Khachaturian’s in 2001 in preference to Alex North’s music: North had scored Spartacus, Kubrick’s film of the epic story of gladiator/slave rebellion that Khachaturian had himself scored for ballet. Khachaturian worked on his Spartacus music beginning as early as 1950, producing three different versions – the final one of which was premiered in 1968, the same year that 2001 appeared. Much earlier, Khachaturian had composed the popular Gayane, a massive four-act ballet about crisis and reconstruction on a Soviet collective farm, filled with spirited Russian dances, of which the popular concert piece “Sabre Dance” is best known. Kubrick’s use of the languid, melancholic Adagio from Gayane to accompany the flight of Discovery toward Jupiter is a stroke of genius. It amplifies the monotony of the astronauts’ existence aboard the ship and adds an overtone of near-hopelessness. The crew is, after all, not only in an empty and sterile environment but also millions of miles from home (and, as we later learn, doomed never to return). The mood created by this use of the Khachaturian adagio finds a more recent echo in Oliver Stone’s Platoon (1986): Samuel Barber’s mournful Adagio For Strings floods the film with foreboding and despair as a yawning air transport disgorges its cargo of doomed recruits onto the shimmering-hot blacktop of Tan Son Nhut Air Force Base, Vietnam. The most experimental music to be found in 2001 is that of the contemporary experimental composer Gyorgy Ligeti, whose turbulent choral atonality combines, for Kubrick’s purposes, the unease of inexplicable occurrence with the adventurous strangeness of the utterly new. The choral phrases of the Requiem, each overriding the one before, create a layering of laments that emerge like the sound of battling winds. This music accompanies the first appearance of the monolith and reflects the furor into which it sweeps the band of man-apes. A portion of the piece is heard again as Discovery is guided by a floating monolith into Jupiter space. But unquestionably the most famous and most emphatically right musical choice in 2001: A Space Odyssey was the selection of the stirring introduction to Richard Strauss’ “Also Sprach Zarathustra” to accompany the film’s key moments of planetary alignment and intellectual propulsion. Johann Strauss’ “The Blue Danube” was already a widely popular piece before 2001; not so “Also Sprach Zarathustra,” nor even Richard Strauss himself, both of only second-echelon importance even in narrow classical and operatic circles. The opening to “Also Sprach Zarathustra” is but a brief introduction to a sweeping full-length orchestral tone poem celebrating Nietzsche’s ambitious philosophical parable of the superman. But by the time Kubrick was done with it, that fanfare was thoroughly and irrevocably associated in the popular mind will stellar spectacle. The news media and NASA picked up on it; so did television commercials and the satirical impulses of comic filmmakers. But even though widely quoted and parodied, nothing has shaken loose the power and appropriateness of Kubrick’s choice, which not only embodied a philosophical and musical rightness but also introduced the music of Strauss to a far wider audience than it had enjoyed before. Becoming in the film a sort of musical emblem of the Nietzschean philosophical theme on which Strauss’ tone poem was based, the fanfare from “Also Sprach Zarathustra” accompanies an alignment of astral bodies at the film’s opening; the man-ape leader’s triumph at discovering the power of the bone as tool and weapon; and the unforgettable finale, when the fetal Star-Child joins a new celestial confluence – and, turning gently, weightlessly, floats into film history.